Our society has been dealing with an ever-increasing prevalence of all cancer types, be it due to an increase of contributing factors or because better and more specific screening methods allow the cancer to be discovered sooner. According to World Cancer Fund statistics, there were more than 14.1 million cancer cases diagnosed worldwide in 2012 and, according to complex computer models, it’s expected that by 2035, 24 million people all across the world will have been diagnosed with the disease. This growing burden that our society faces with chronic diseases has started forcing researchers and medical professionals to investigate the complex molecular mechanisms responsible for malignancies. Among the cancer types most prevalent among patients, lung cancers (in men) and breast cancers (in women) reign supreme, representing 13% respectively 11.9% of the total number of new cancer cases diagnosed. Leukemia, on the other hand, only represents 2.5 percent of all new cancer cases. Of all leukemia types, chronic lymphocytic leukemia (or CLL) is the most common form in the western world, accounting for approximately 25% of all new cases of leukemia. First and foremost, let’s address the definition of the term leukemia. It is a type of cancer which begins by affecting the bone marrow’s blood forming cells. Once on this unnatural course, leukemia cells no longer mature normally and divides differently than normal cells. As opposed to other cells of our body, leukemic cells cannot respond to the chemical signals which trigger apoptosis (programmed cell death) and divide much faster, producing new leukemia cells. With time, abnormal cells accumulate in the patient’s bone marrow and crowd normal ones until they begin spilling into the patient’s bloodstream causing an abnormal increase in white blood cell counts. Chronic lymphocytic leukemia follows the aforementioned patterns: the malignant process begins in the bone marrow. 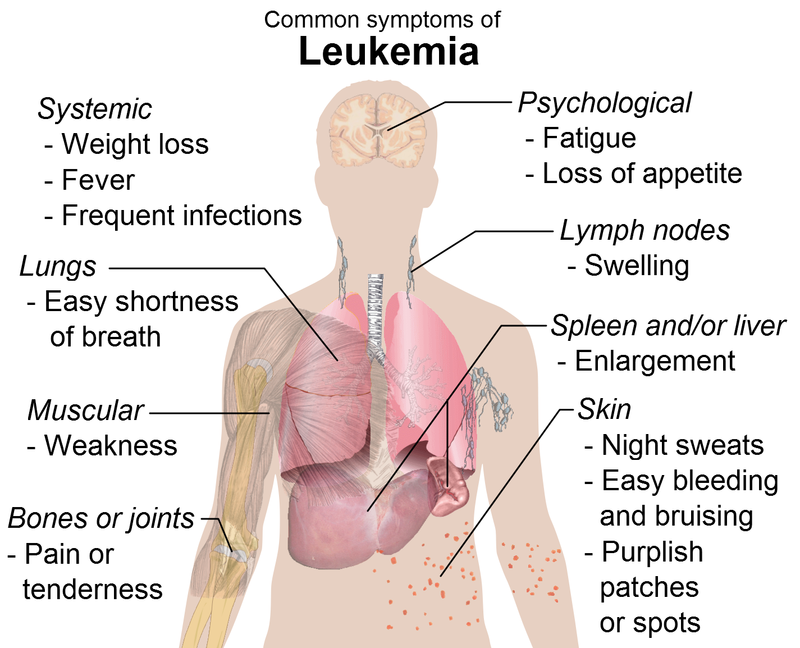 The leukemia cells mature into specific lymphocytes (certain white blood cells) which reach the bloodstream slowly, so that people don’t immediately experience symptoms and only present with swollen lymph nodes, increased spleens or livers. These abnormal, seemingly mature defective and malignant lymphocytes have unnaturally long life spans and begin infiltrating organs such as the spleen, the liver and the lymph nodes. Regarding CLL’s occurrence in the American population, the American Cancer Society has released estimates for 2015. Of the 54,270 new cases of leukemia expected to be diagnosed, 14,620 are believed to represent newly diagnosed chronic lymphocytic leukemia cases. Similarly, the American Cancer Society estimates approximately 24,450 deaths from leukemia in 2015, 4,650 of which will be caused by CLL. Luckily, the occurrence of chronic lymphocytic leukemia increases with age and 75 percent of all cases are diagnosed in patients aged 60 years or older. Because CLL affects older adults, with an average age at diagnosis of 71 years, adults under the age of 40 and children are rarely diagnosed with the condition. Men have a slightly higher risk than women of being diagnosed with CLL. CLL is a relatively quiet disease in the sense that symptoms may be completely absent. In other cases, they are so subtle that patients only notice differences when the disease had advanced. More often than not, these symptoms are not recognized by patients and physicians or GP’s discover abnormalities during routine blood tests which require additional investigations. Despite extensive research, doctors are still uncertain as to what exactly causes CLL. Among the theories explaining the process during which normal cells become leukemic, a genetic mutation in the DNA of bone marrow cells is incriminated. The blood producing cells in the bone marrow presenting this mutation begin producing ineffective lymphocytes which multiply uncontrollably and interfere with the production of normal, functioning blood cells. In order to correctly identify CLL, physicians conduct a series of tests and procedures, most of which are blood tests. A complete blood count is the first step which leads a doctor on the path towards diagnosing CLL. It is completed by a peripheral smear and confirmed by thorough bone marrow examinations which count the total number of lymphocytes: >5.000 peripheral lymphocytes per microliter and increased lymphocyte counts in the bone marrow (>30%). After the diagnosis has been set, physicians have to address clinical staging. The chronic lymphocytic leukemia stage is relevant in any future treatment. Treatment plans are highly dependent on the clinical stage of your leukemia, the symptoms you may or may not be experiencing as well as your overall state of health. In its early stages, CLL is not typically treated (although researchers have been investigating whether ultra-early treatment may be helpful). Scientific literature suggests that early treatment cannot improve life expectancy for chronic lymphocytic leukemia patients. Intermediate and advanced cases involve multiple treatment options, including chemotherapy, targeted drug therapy (such as rituximab, alemtuzumab, or ofatumumab) and bone marrow transplant. Though these treatment options alleviate symptoms and have been shown to prolong survival, experts warn that overtreatment may sometimes be more dangerous than undertreating the disease. Supportive care is also important for patients who require to maintain their quality of life as long as possible. Currently, patients receive transfusions of red blood cells or erythropoietin (a hormone critical for red blood cell formation) as well as platelet transfusions and antimicrobials. Radiation therapy is also an option for palliation and can involve treating specific regions or total body irradiation, which has been shown to ameliorate symptoms when administered in small doses. Even with the best efforts, CLL patients don’t face an excellent prognosis. Statistics show that the average survival rate of chronic lymphocytic leukemia patients is approximately 7 to 10 years. Life expectancy depends on the clinical stage of the disease. If a patient is diagnosed with a Rai stage of 0 to II, he or she may live for 5 to 20 more years. Rai III and IV stage-patients, however, only have a life expectancy of 3 to 4 years following their diagnosis. Other key factors pointing towards a rapidly progressing illness and short survival rates include the progression to bone marrow failure. Researchers are hard at work attempting to identify new diagnosis, screening or treatment options. Recently, a German team of scientists developed targeted sequencing panels to be used in the diagnostic process, while new drugs such as AbbVie’s ibrutinib has been shown to improve progression-free survival of CLL patients. Scientists have been making tremendous progress in treating CLL and hopefully, the cure is right around the corner.